Are you tired of looking out of those dirty windows and need to find a reliable and professional window cleaner? 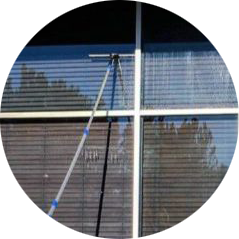 Our team of trained technicians use specialized window cleaning equipment as well as a proven multi-step system to ensure that you get the cleanest windows possible. Our pure water and water fed pole system will ensure that your windows are left spot and streak free. Window panes inside, outside, or both. Entrance and sliding door windows. Convenient Scheduling: daily, nightly, weekly, biweekly, monthly, or annual services.